Most video games are about story — some more than others. 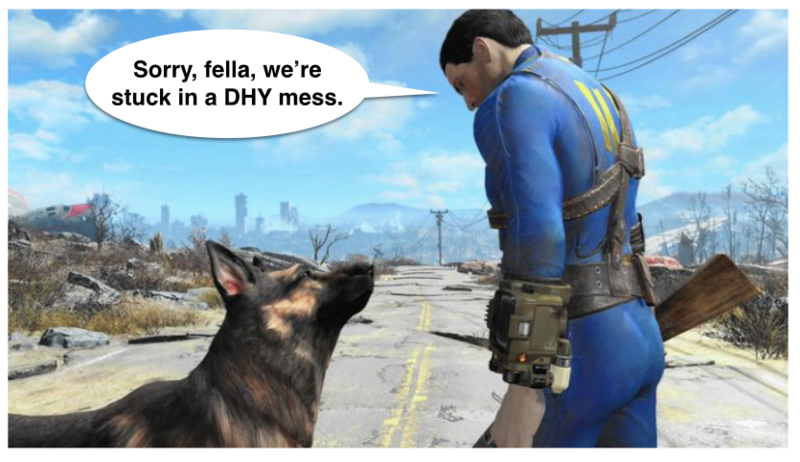 The LA Times review of the new game “Fallout 4” dings it for errors of both AAA and DHY, though they don’t have the terms for it. Stories begin with AAA (and, and, and). It’s called exposition — an assemblage of neutral facts that don’t yet engage the narrative centers of the brain. Not enough exposition and the story is confusing. Too much, it’s boring. The LA Times reviewer for the new video game Fallout 4 says it took him 10 hours just to get to “the game’s first major city,” which he says was the first moment he began to actually warm to the game. That’s kind of like the end of the first act — the story is finally up and running, the audience is engaged. He goes on to lament about that being just too much time — pretty much like a movie that takes forever to get to the first dead body. That’s an AAA problem — too much, “AND then we learn about this, AND then we learn about this, AND then we learn about this …” Enough already, get on with the story. What’s a bigger concern is the overall feel of the game being just too complex. After 10 hours of play the reviewer says, “It still feels as if I’ve opened a board game for the first time, and before me lies the virtual equivalent of hundreds of tiny plastic pieces and the overwhelming dread that mastery won’t come easy.” This is the situation I’ve described in my new book as DHY — Despite, However, Yet — representing the situation of too many narrative directions at once. The point of this post is not about video games (I don’t have the time to spend 10 hours just getting into one, though I wish I did). The point is how broadly the Narrative Spectrum applies to any world in which story is present. Show me a story, any story, and I’ll show you the forces of AAA, DHY and ABT at work.